So excited to be having Jessie of Style and Pepper on today! She's a style correspondent for Harpar's Bazaar On-Air, and does lots of traveling. I just adore Jessie because she's just so gosh-darn fabulous! 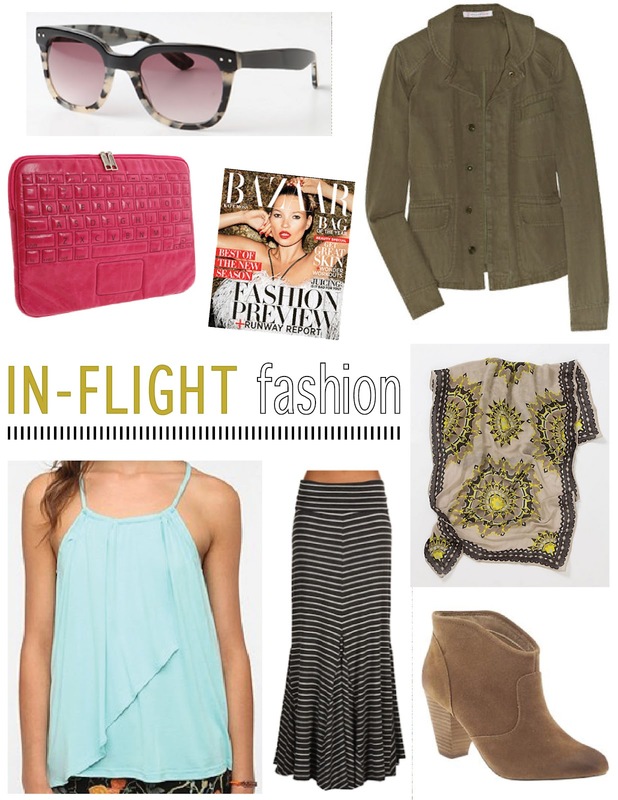 Today she is sharing some really wonderful tips on in-flight fashion. Enjoy! Sunnies - Gotta keep those peepers protected! I keep mine safe by tucking them in this embroidered Johnathan Adler case. Jacket - The lightweight fabric and neutral color of this military-inspired anorak are just perfect, and I love that you could fill the pockets with essentials like chapstick, your ID/boarding pass & your favorite gum. Laptop Case - I always fly with my computer, and this adorable case would be the perfect replacement for the boring black neoprene one that I currently use. Harper's Bazaar - I usually prefer my Kindle, but always have a few mags with me so that I have something to do during take-off and landing. Tank - Flowy and bright, both very important criteria for my layering pieces to build upon. Skirt - Maxi's are great flying options, but make sure to pick one that won't wrinkle and has a comfortable waist band. If you're not a skirt person, you could easily sub in your favorite leggings and change the tank to a tunic! Scarf - A pretty pattern to wrap around your neck, and cover your arms/shoulders in case the air condition on the plane or in the airport gets too chilly. ohh good idea with the boots! Aww some great tips there actually, I'll remember those! great suggestions - especially loving those boots & the skirt! i love that tank...i could use that all summer long! Love, love, love those boots and sunnies! WHat a great outfit! I always struggle with what to wear when flying but not anymore! Thanks for sharing! Love the idea of the maxi skirt and cargo jacket...super smart to put a few things in the pockets for easy access! Loved the skirt, so cute!! Great tips, love all the essential items that you included. Great choices for traveling. I'm flying to london next week and I'm most stressed about the long flight and flight outfit. I am in such agreement...this is pretty much exactly what I wear when traveling! Maxi skirt and boots=perfect comfort. I used to wear the same! Nice post! That striped maxi skirt is too cute!